Sanaa Lathan plays a world class guide in Alien vs. Predator...and she clearly demonstrates that bloodthirsty extraterrestrials are no match for an experienced mountain guide. I would tend to concur. Robin Tunney plays a mountain guide on K2 in the worst best climbing movie of all time, Vertical Limit. We all learned a valuable lesson about guides in that movie, the lesson that it's important to bring nitroglycerin on any and all mountain expeditions. 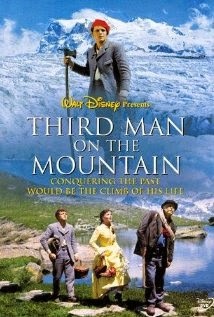 And then there's Third Man on the Mountain. You'd be forgiven if you didn't know this 1959 Disney film. But you're probably aware of the Matterhorn ride in Disneyland. This film was the inspiration for that ride. And it's no wonder, because the iconic mountain plays a central role in the film, as an infamous peak known as the Citadel. Third Man on the Mountain is a beautiful film set high in the Alps during the golden age of alpinism. In other words, it was a time when guides and their charges worked together to develop new lines on unclimbed peaks. Rudi Matt, a young kitchen worker, is determined to conquer the Citadel – the jagged, snowcapped peak that claimed his father's life. Encouraged by both a famed English climber and the youth's devoted girlfriend, Rudi goes through a grueling training period before he is ready to face the incredible dangers of the killer mountain. There is a great deal of climbing in the film that doesn't seem realistic, but it can be forgiven. Why? Because the heart of the film is in the right place. It's a coming of age story about a climber who wants to make the mountains a permanent part of his life. It's the story of an imposing route that that young man looks at every day. And it's ultimately the story of the young man's journey to the mountain. Most of us can relate to this story. It's sometimes difficult for those of us who are used to high end special effects to watch older films. It's usually obvious when they shift from scenes that were shot on location to scenes that were shot in a studio. Occasionally you can tell that you're looking at a matte painting... But the story is so nicely portrayed that I was able to suspend my disbelief and live in the moment throughout the film. Of particular note, Gaston Rebufatt directed the second unit film crew for all the mountain and climbing shots. Rebufatt was the French guide who wrote the iconic book, Starlight and Storm, and participated in the first ascent of Annapurna. Third Man on the Mountain was based on the 1954 young adult novel Banner in the Sky by James Ramsey Ulmann. This award winning book was republished in 1988 by Harper Teen and is apparently used as a middle and high school reading assignment.